Aqua Aura Spirit Quartz stimulates the Throat chakra and encourages openness, expression of affection and appreciation of others. It encourages openness, expression of affection and appreciation of others. It expands the boundaries of possibility and helps dissolve limitations. A wonderful stone to help families understand one another, it is also beneficial in the workplace, and assists in manifesting one's highest potential in life. Light Blue crystals help in developing patience, reconciling differences and in seeking forgiveness. Aqua Aura Spirit Quartz utilizes Water Energy and may be used in devotions to the Mayan Goddess of the Four Ages of Women. Aqua Aura crystals resonate strongly with a vibration that is powerful to aid communication and psychic gifts. They have an excellent healing energy in the body, to cleanse and heal your auric field. Once the Aqua Aura Quartz crystals have calmed your emotional body and healed any holes in the auric field they will then activate your chakras. They are strong healing stones and are powerful used in healing to intensify the vibration of other stones that you may wish to use them with. Aqua Aura is highly stimulating to the throat Chakra, enhancing one's ability to communicate inner truth, at it also has a soothing and relaxing effect on the emotional body. Aqua Aura Quartz can be used to soothe anger, cool feverishness, and release stress It is strongly connected to the element of water, and it is therefore a stones for enhancing one's access to the truth of the emotions and the portals of Spirit which are accessed through the emotions. Aqua Aura Quartz has a very high and intense vibration. 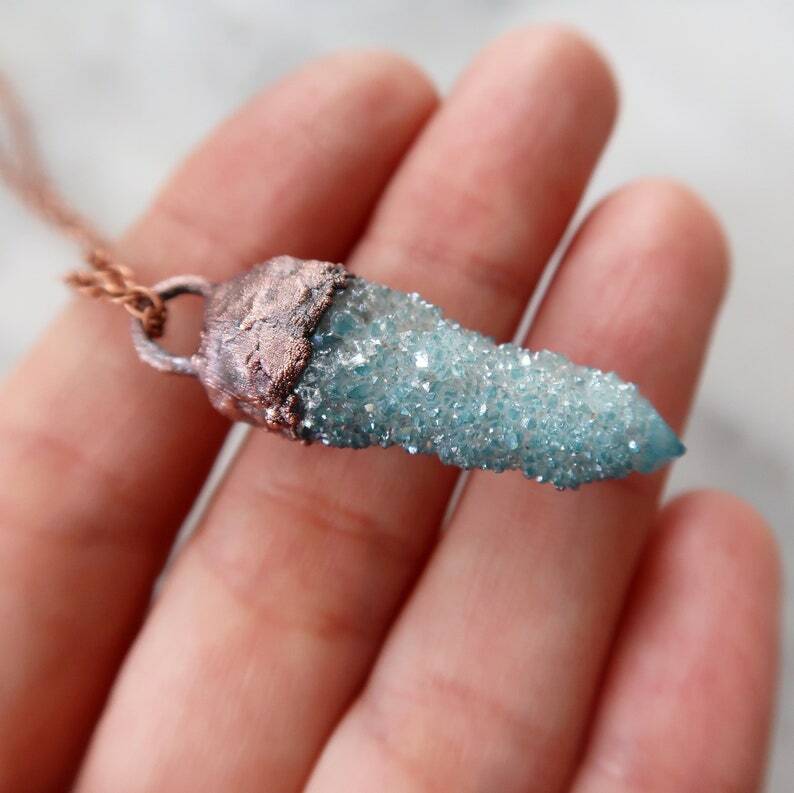 It has been used to activate the energy of other minerals and gemstones for healing work, and can be a potent stone when used in body layouts for activation of the Chakras. It can be success fully applied to smooth and heal the Auric field, and to release negativity from one's emotional, physical, intellectual and spiritual bodies. Wearing Aqua Aura Quartz is said to help one to shine with one's inner beauty, to attract wealth and success, to bring forth esoteric wisdom, to relieve depression & anxiety, and to assist in creating an aura of peace & well being in oneself and one's surroundings. It is a stone of spiritual elevation, which can serve to help raise the vibration of humanity. It can also be an aid to those who wish to become conscious channels for spiritual wisdom, clearing and opening the pathways of inter dimensional communication.